The tongue and mouthparts are covered in tiny hairs and these hairs have pores in them. Molecules pass through these pores and stick to receptor sites on sensory cells. This is how the bee tastes and smells. 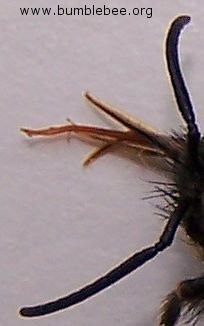 The main concentration of these hairs are on the antenna and mouthparts (this page). 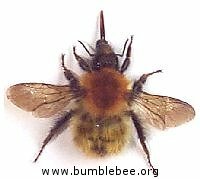 In the UK Bombus hortorum (see the photograph below) has the longest tongue which can reach just over 2 cm when fully stretched. When the bumblebee drinks nectar the sheath is moved so it is facing the entrance of the flower. The bumblebee then moves towards the nectar and the tongue itself shoots in and out soaking up the nectar. Average tongue lengths measured from foraging bumblebee workers. In the table of tongue lengths above, the measurements were taken from live workers foraging. The bumblebee tongue is an elastic organ, when dissected and measured the length will be longer than those in the table. A pipette marked in millimetres and filled with a water/honey solution was offered to workers. The meniscus was moved up to see how far they would extend their tongue to reach the mixture. This work was done many years ago. Now I would advise a water/sugar mixture to avoid spreading disease. If you look up at a flower against the sunlight while a bumblebee is drinking you can just see the tongue through the flower. If you want to get a better look you can try feeding them with a solution of honey or sugar and water in a plastic pipette. Using a plastic pipette like this is also a good way to measure the length of the tongue. So why all the fuss about tongue length? Well it is one of the most important things to measure in a bumblebee. They get all their food from flowers. Most of the pollen is used to feed the grubs, so the adult bumblebee's food is mainly nectar. Flowers come in all different shapes and sizes. The nectary (location of the nectar) is usually deep inside the flower and the bee has to be able to reach it. In many flowers only bumblebees and some moths have tongues long enough to reach the nectar, so only they can pollinate these flowers. Look at the photograph of Bombus hortorum below. She is drinking nectar from a lavender flower because her tongue is long enough to reach it. A honey bee's tongue is too short, and even Bombus terrestris with her big, heavy body would find it hard work drinking from lavender. So the length of tongue determines which flowers a bee can forage from. Of course, in nature, nothing is ever quite so simple, and Bombus terrestris and lucorum with their short tongues and relatively powerful bodies eventually found a way to get at the nectar of the more difficult flowers by becoming thieves and nectar robbing. Above a Bombus terrestris or lucorum worker has her tongue in the nectary of a flower and is drinking the nectar. Below is a Bombus pascuorum queen with her tongue sheath extended out in front. Normally the sheath is folded under the body and only moved forwards to drink nectar. Below is a Bombus hortorum (Garden bumblebee) worker drinking nectar from a lavender flower. 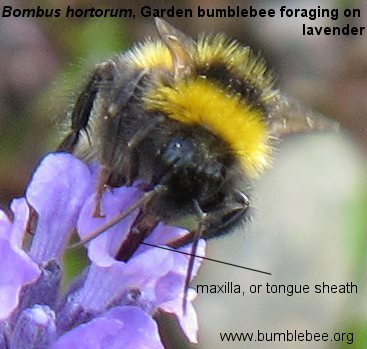 Lavender has a fairly deep corolla before the nectary is reached, and most bumblebee would have to stick their head right into the flower to reach the nectar, but hortorum has such a long tongue that she can easily reach the nectar without even using the full length of her tongue. 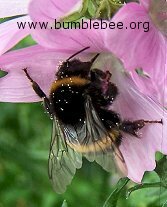 The bumblebee has a long, reddish-coloured tongue that is hairy at the end so is good for soaking up nectar (see above and below). 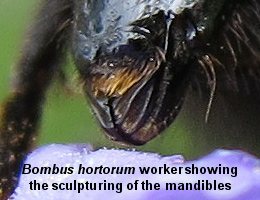 When the bumblebee is flying the tongue is folded under its head and body inside a horny sheath formed by the palps and maxillae, see the photograph above. 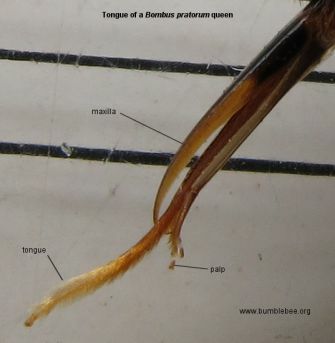 In the drawing below and the photographs above and below the tongue itself is the long thing in the middle, the two outer parts on each side form the sheath, they are called the palp and the maxilla. Like our own tongue the bumblebee tongue is stretchy and good at licking and soaking up sweet nectar. I get many e mails from people telling me bumblebees are drilling holes in the wood of their house/shed etc. the insects doing this are usually carpenter bees, not bumblebees. The mouthparts of a bumblebee are not strong enough to drill holes in wood, nor can they bite with any strength. This can be seen in the photograph above showing the mandibles (jaws) of a worker bumblebee.